Weddings are huge in India – that is a highly redundant fact to state. The wedding industry thrives on its branches of decor, jewellery, food, locations, destinations, photographers, and clothes. More than anything – clothes. Which is also why Indian fashion weeks that showcase couture are not haute couture, high fashion, luxe, expensive dresses as the French intended but more of wedding wardrobe that brides, families, and friends feast their eyes, hearts, and soul in. And the Indian designers, who venture into Indian wedding couture, don’t let us down at all. With social media being the center of all launches and public-relations activities these day, it doesn’t come as a surprise that designers (who didn’t showcase at the Indian Couture Week that was held in Delhi in the first week of August) are showcasing and launching their collections online. 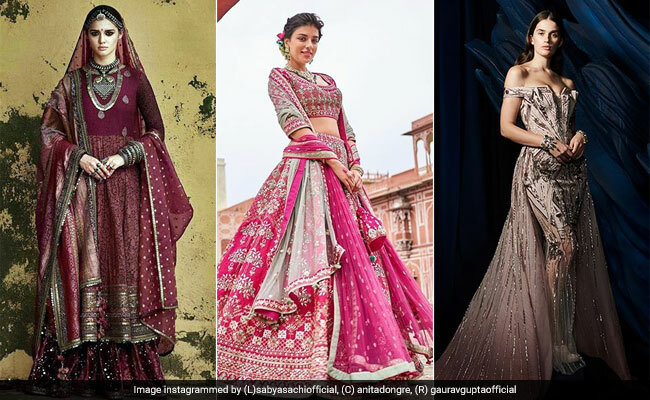 Among them, Anita Dongre, Gaurav Gupta, and Sabyasachi are three designers who have recently posted a mix of videos, pictures, and banners of their artistic wedding collections. Needless to say, all of them are gorgeous and it won’t be an overstatement to say that it is an exciting time to be a bride-to-be. The collection is a story of love and togetherness, and the coming together of two people. Rife with heritage crafts of Rajasthan. Nature motifs such as pine trees, fruits hanging off branches, birds of Ranthambore, forests are dazzlingly represented in gotta-patti, boota embroideries, and gold applique. The colours are muted and yet on a brighter side and eye-catching, something that goes well with the wedding season and ethos of Rajasthan. Gaurav Gupta’s signature style reflects strongly in this collection. For the modern bride, who wants to wear something light years different for her wedding cocktail, youngsters’, and reception party, Crystal Myth is a collection that is just right. A fine mix of dreamy crystal work on asymmetrical and sculpted gowns. And it is not all monotones this time either – there are gowns with colourful beadwork, light pastels with cascading crystal work around, geometric panelled sherwanis, and lot more. It’s a riot of colours reflected off a prism. There is no other word for it – Sabyasachi’s latest collection is as luxurious as his summer collection was breezy and cool. Reviving the use of endangered textiles, heritage crafts, and antique techniques, the designer came up with pashmina lehengas, outfits with an amalgamation of crafts (such as zardozi, kantha and chikankari), and exquisite jewellery to go with it. Its one melange of arts for the textile connoisseurs. Winter brides, you are all set.